Since the late 1800s, historians have debated the importance of the frontier on the development of American institutions and culture. For some, the Western frontier was the source of American innovation and individualism. 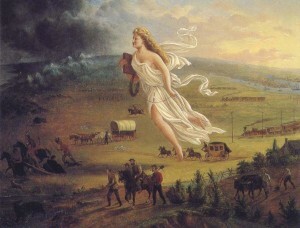 For others, the Western frontier is a symbol of American ethno-centrism and imperialism. Perhaps, it is neither, but rather, both. While the story of the American frontier is one of rugged individualism, it is also a story of oppression. But there is another aspect that may help reconcile these conflicting views of the frontier in American life. Since the earliest colonial days, the frontier played a significant role in the development of American democracy. As American settlement moved west, not only did democratic institutions follow, they evolved. As Western states sought to increase representation to compete against Eastern states, state voting laws expanded to allow greater participation in the electorate. To avoid losing population, Eastern states expanded their voting laws as well. Over time, historic restrictions on the right to vote, such as property qualifications and gender, gave way to a growing egalitarianism that would come to characterize American democracy by the twentieth century. Yet to understand this process, one has to look to the Western frontier, in particular the Wyoming territory. In 1869, Wyoming was the first U.S. territory to allow women the right to vote. By the end of the nineteenth century, the Western states of Idaho, Utah and Colorado all granted women the right to vote in their elections. While August 18, 2010 is the 90th anniversary of the nationalization of Women’s Suffrage, it is important to note where this process began and why the right to vote is not only fundamental to the evolution of American democracy, but American life and culture as a whole. While historians may disagree about the role the frontier played in the development of American institutions, they can’t deny the importance of its influence. 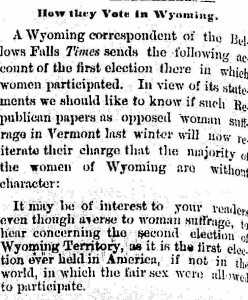 A simple "Headline" search on "Wyoming" and "vote" in America’s Historical Newspapers can help one begin to explore the frontier’s impact first hand.